My family loves breakfast, especially the kids. Finding time to make a hearty breakfast on busy school mornings usually slips away from me and the kids end up with cereal. However, most Saturday mornings are reserved for a special breakfast in our house. You might as well call it brunch because we typically don’t eat lunch that day. We usually sleep in a little, Quinton and I have coffee, and then I get to work in the kitchen making something worth a real plate, fork, knife and spoon. I love these mornings. Sometimes one or all of the kids eventually join me in the kitchen, after smelling bacon cooking, to help out with breakfast and then we gather around the table and actually have conversations face-to-face about whatever’s on our mind. 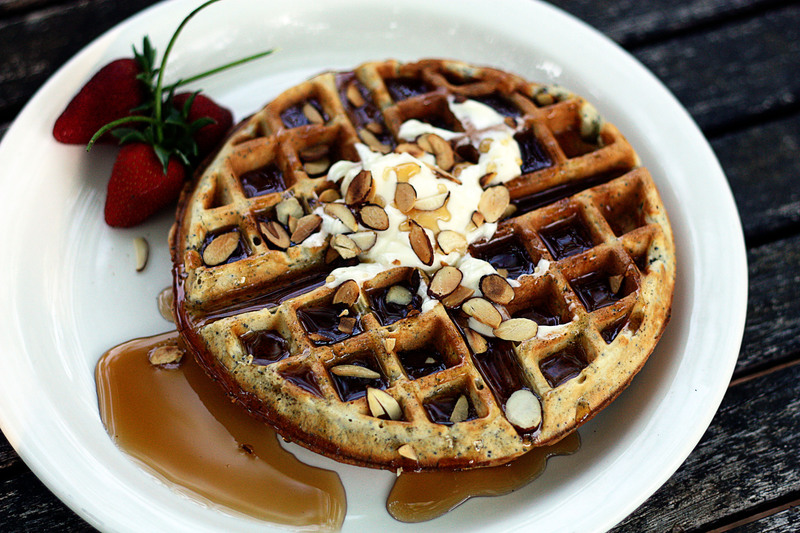 These almond poppy seed waffles are full of great flavor and texture. The toasted almonds and poppy seeds give this Belgian-style waffle a heartiness and good crunch. They are well worth the time and effort! Heat the oven to 200°F. In a dry skillet, toast almonds over medium heat, tossing often to evenly brown. Remove from heat immediately and place on a plate for serving. Place the almond paste in the bowl of an electric mixer fitted with the whisk attachment. Add the milk, sour cream, almond extract, and eggs. Whisk until well-blended and smooth. In a separate large mixing bowl, add the flour, sugar, baking powder, salt, and poppy seeds. Whisk well to thoroughly combine. Slowly pour the liquid ingredients into the dry ingredients while gently stirring, and mix just until combined. (Don’t overmix or the waffles will be tough and chewy). The mixture will be a little lumpy (and that’s OK; if you have pockets of flour bigger than a dime, smash them against the side of the bowl to break them apart without having to stir the batter more). Pour in the melted butter and gently mix with a spoon just until incorporated. If using an electric griddle or waffle maker, set the heat to 350°F. Spray griddle or waffle maker with cooking spray. Ladle batter onto waffle maker and cook until golden brown. Keep the waffles warm on a heatproof platter or baking sheet in the oven. Serve with whipped butter, maple syrup and sprinkle with toasted almonds. 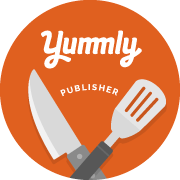 I am passionate about good food, cooking for family and friends, and creating recipes that form lasting memories from one generation to the next. I hope you find inspiration for cooking and creating here!